I'm pretty sure that a lot of you have heard me profess my love for ice cream cake. It's a magical thing from the random varieties to your standard version filled with a layer of chocolate crunchies. I don't cover these types of treats a lot (because I rarely see a "new" one around), but it seems these things are always called cakes, not pies. The only "pie" I've reviewed was the cookie dough one my wife brought home from Cold Stone way back in 2011. Well this was a present from my in-laws yesterday. 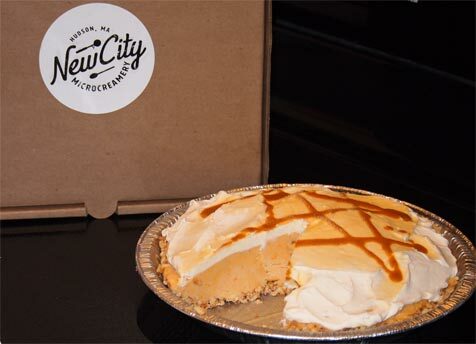 It's a Pumpkin Ice Cream Pie from New City Microcreamery in Hudson, MA. 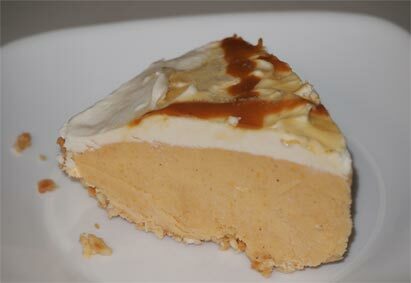 It's Pumpkin Pie ice cream, whipped cream, caramel drizzle, and something they call a "cone-cookie crust". I didn't have the description when I first dug in, so I couldn't quite place the flavor of the crust at first, but once I was told it had to do with waffle cones then it all made sense. It's unique though I wish that they mixed more little bits with all the big bits to make a crust that was a bit more traditional. Did I mention that NCMC uses liquid nitrogen in their ice cream making process? I should stop by and see it for myself because I dont know if you are allowed to eat it freshly frozen or if you have to wait until after it spends two hours in the freezer. I bring this up because I had no idea how long to let the pie (and then the slices) temper. The softer the slice got, the more the pumpkin spices came alive. With less tempering, the ice cream was quite dense and also not as flavorful. They also had an eggnog version (no thanks), a pecan version (not safe to bring home), and an apple version that had some kind of crumb top. Which one would you have brought home? Or for a more general question, have you had ice cream made with liquid nitrogen? P.S. I hope everyone had a nice Christmas yesterday. Sub Zero makes their ice cream by the nitrogen process. They have multiple locations across the country. It's kind of fun to watch the nitrogen gas flow around while they make your request. The ice cream itself is decent, probably worth it more for the wow factor of making it than eating it. But I hadn't heard of a company making it in pie form before, that's pretty neat! Def a cool concept, I wouldve gotten the apple and pumpkin kinds. Merry Christmas! I have seen people make liquid nitrogen ice cream at science fairs hosted by MIT. It took about 10-15 minutes and people could eat it right away. It was neat to watch. Unrelated but not sure where else to ask this: do you happen to know if Prestige ice cream is a national producer that sells under different stores labels? I live in MA but had prestige when in Florida (sold at Winn Dixie) and the mint chocolate chip was so good. I was wondering if it was sold anywhere else (by appearance I thought maybe breyers but it is so much better and definitely richer and different chips. ) Anyone know? @Sarah: I'm pretty sure I've seen them on the internet before. I didnt think they were even remotely close but apparently there is one in Nashua, NH. Thanks! Nope, it definitely was NOT frozen dairy dessert..it was good!! We made liquid nitrogen ice cream in my intro chemistry class in college. Chem was not my thing, but that was a blast! Oh, and belated merry Christmas and Happy new year! Deb - In the 1990's the Prestige label was made for Winn Dixie in the company's own ice cream plant (Superbrands, in Florida). The plant was subsequently closed and I don't remember them moving the brand to another co-pack location after. It came in a squarish container with a plastic lid. It had more butterfat and lower overrun than most store brands and was very competitively priced, a nice balance between cost and quality in its time. @RB: thanks for the info! Thank you R Bohn. I got off topic from the post so I'll leave it here but I appreciate the info. I had thought it was closest to the yeungling mint chocolate chip (albeit a different color)...regardless, it was delicious. If I lived around a Winn Dixie (or other store carrying it), I'd love to try the other flavors! Ok, no more off-topic comments from me on here.